Composer of The Barber of Seville and Moise et Pharaon. He was one of the most popular composers of his day. He studied as an apprentice of musician Giuseppe Prinetti. 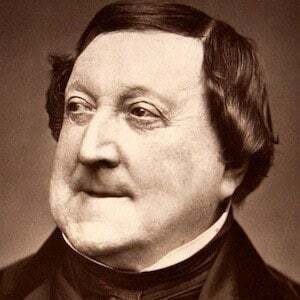 He wrote 20 operas, including Otello and La Cenerentolar, between 1815 and 1823. He married Isabella Colbran, an opera singer, in 1822. After she died, he began courting Olympe Pelissier, whom he married in 1846. He corresponded with composer Ludwig van Beethoven, who encouraged him to continue writing operas.